This weekend I went to Barcelona and met my friends there! They are also studying abroad, but we were able to find a weekend that worked for all of us to meet up. 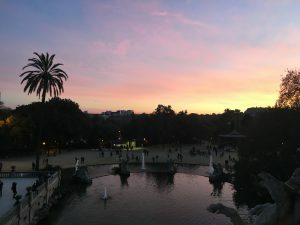 While planning a weekend in a different country with friends abroad is tricky, it is totally worth it! We were very lucky to have this weekend all together, and what a weekend it was! 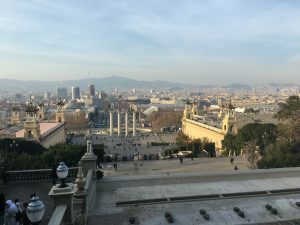 After walking 36 miles through the city we saw our fair share of Barcelona! On Friday evening we had a traditional Spanish dinner of paella, tapas and churros. We had dinner pretty late at night, but the city was lively, and many stores were still open. 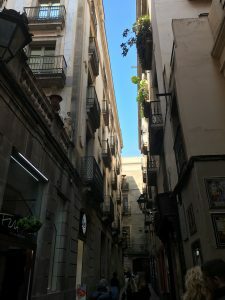 Saturday morning, we didn’t have an exact plan in mind, but with our hostel map in hand and a rough guide of what we wanted to see, we headed out. Usually I prefer to have my day scheduled out, but sometimes it is easier to go with the flow and see what we find. We walked down the main street with all the fancy stores to Catalonia Square. 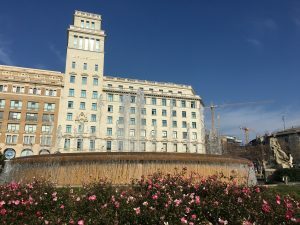 It was a beautiful sunny day with nice blue skies, the perfect temperature. 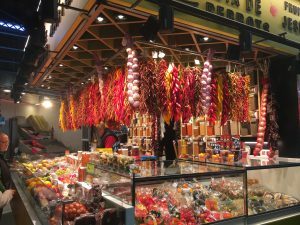 We walked down La Rambla and found La Boqueria. The market was amazing and just how I remembered it from five years ago. 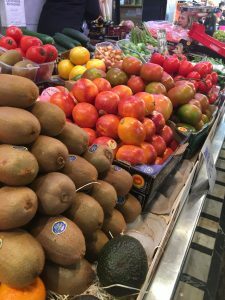 There was so much fresh fruit, vegetables, a seafood area, meats, cheese, chocolates, and spices. All of the colors, smells, and people were a lot to take in, but awesome to see. We grabbed what we could and had a mini picnic for lunch. 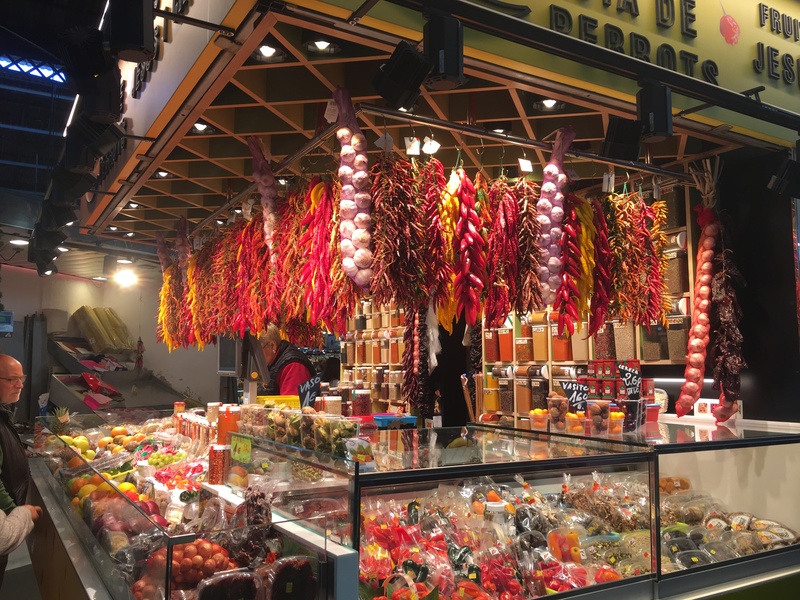 Fruits, vegetables, chocolate, spices and more at La Boqueria. We continued down to the water and saw the massive cruise ships in the docks. 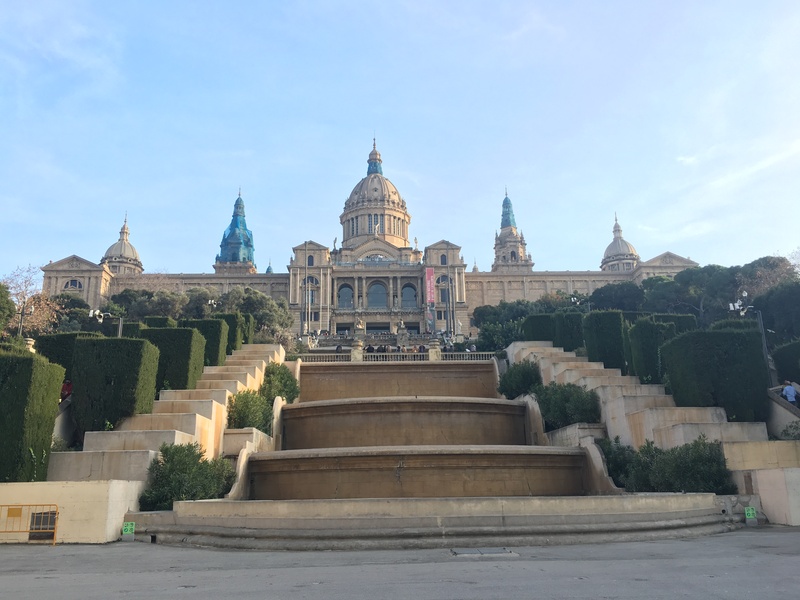 We walked down near the base of Montjuïc to the Font Màgical and walked up to see the amazing view of the city from the Palau Nacional. This view was simply amazing. I could see all the way across the city, and I was constantly surprised how large it was! In the past couple weeks, I have gotten used to a quaint little fishing town, so going to all of these large cities is very different! 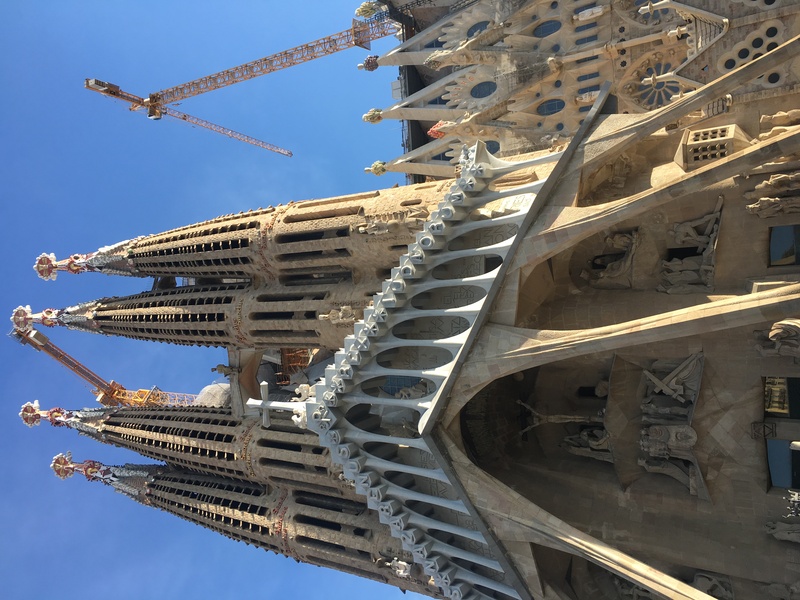 Finally, on Sunday we got to the part of Barcelona I was most excited for: La Sagrada Familia. I had seen this church on my last trip, but didn’t get a chance to go inside, so I knew this weekend I would have to go. I was very excited to see that attending mass here was a possibility! We got in line early Sunday morning to attend, went through security, and patiently waited under the shadow of the Nativity Façade to enter. It did NOT disappoint. Here is some information on this church. 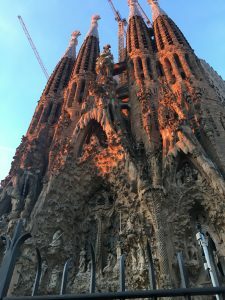 Construction began in 1882 on the Basílica I Temple Expiatori de la Sagrada Família. 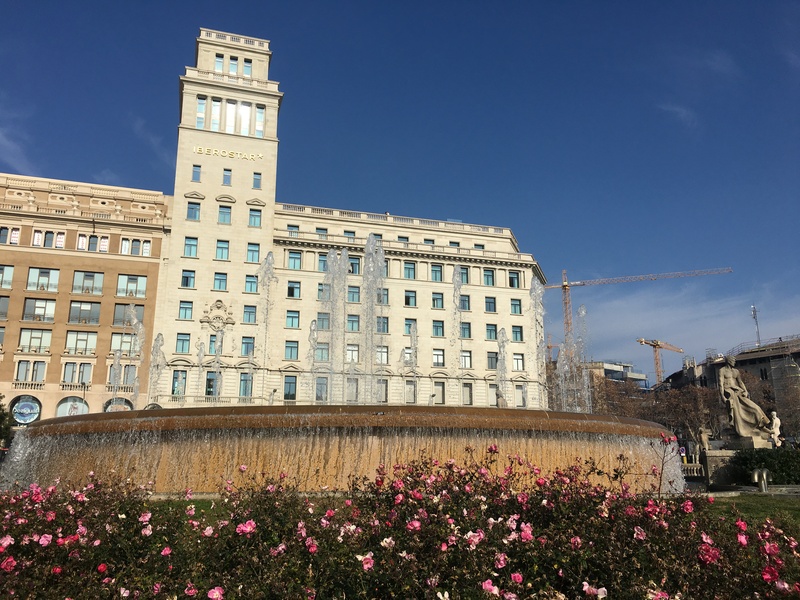 In 1883 the main architect died and Antoni Gaudí took over the designs and production. 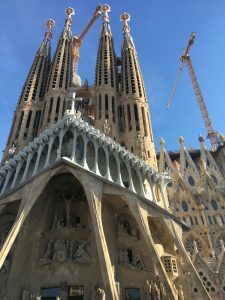 The church is still under construction and will hopefully be complete in 2026. There are three main sides to the exterior church. The Nativity Façade, the main entrance, was mostly finished when Gaudí died. The Passion Façade and the Glory Façade. The Glory Façade will be the largest and most elaborate side when complete. Each side is a different architectural style. 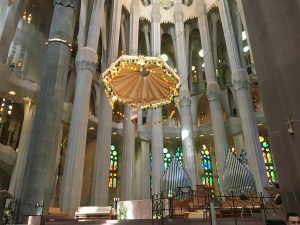 The inside of the church has soaring ceilings and enormous tall pillars. All aspects of the architecture draw the eyes upward. There is not one single flat surface and the pillars all connect like trees branches. 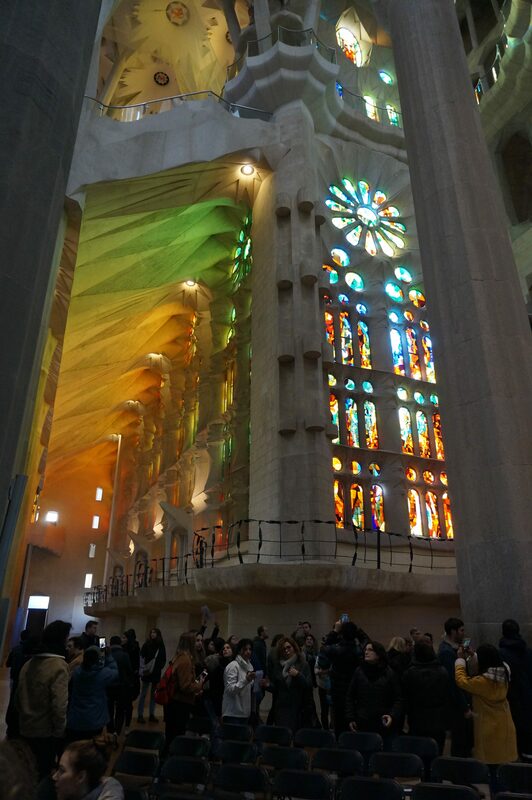 The stained glass lining the walls was beautiful and once the sun came through rainbows were everywhere. It was really a dream come true to see the inside of this building I have admired and to participate in mass there was truly special. I really appreciated that mass was open to the public. I thought that a church as famous as this one might close its doors for mass. 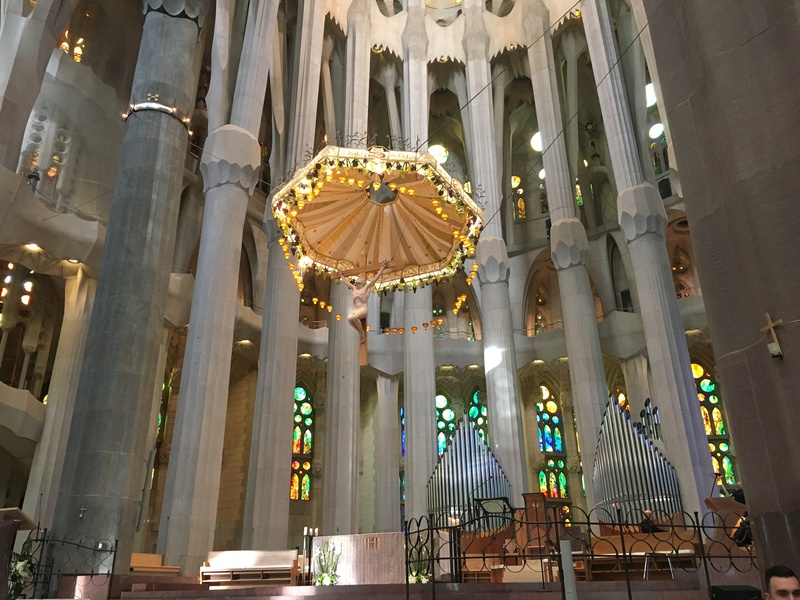 However, Sunday morning mass here was the International Mass and was said in five different languages: Catalan, Spanish, French, English, and Italian. 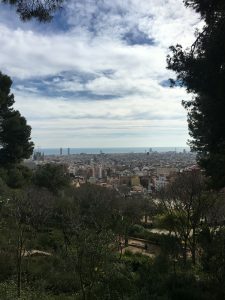 After mass we had a fabulous Sunday brunch and hiked up to another Gaudí masterpiece, Park Güell. This park was massive, and we walked a decent amount of it. We saw some more great views of the city and enjoyed walking through nature. At the end of the day we saw a beautiful sunset in a different park and took a nice stroll across the beach at night. After walking 43,000 steps Saturday and another 36,000 on Sunday that cool sand was a great massage on our aching feet. 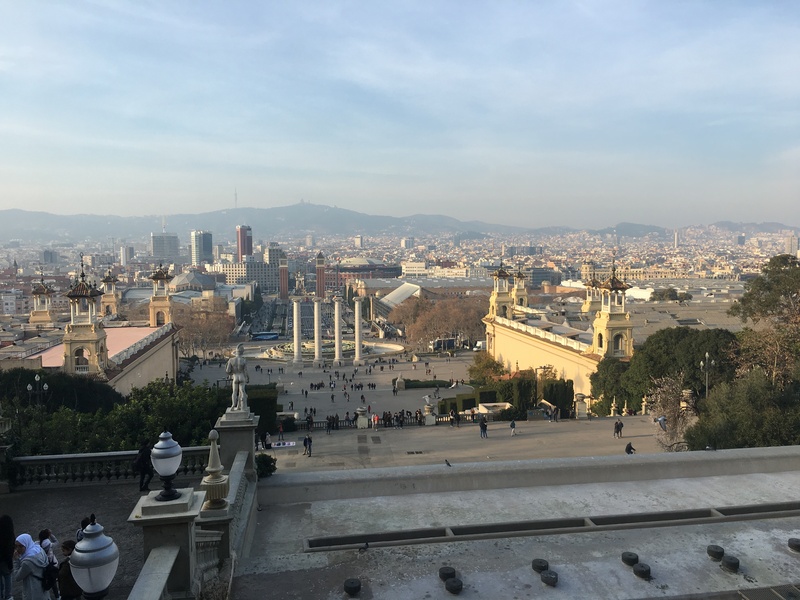 Walking 36 miles around Barcelona was tiring, but SO worth it!